Image caption Dan Poulter said facing the allegations was "a horrendous episode"
An MP has been given an apology and won "substantial" damages from a newspaper that published false claims he had sexually assaulted three women. 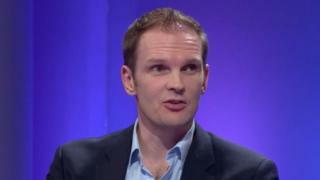 The Sunday Times had reported that Dan Poulter had put his hand up the skirts of three female MPs. It told the High Court on Monday there was "no truth" in the claims, offering "sincere and genuine apologies". Mr Poulter, MP for Central Suffolk and North Ipswich, said it had been "a horrendous episode". He said: "These utterly unfounded allegations were published against me at a time of enormous frenzy about the supposed misconduct and wrongdoing of various MPs. "Like many of the lurid claims made against numerous MPs at that time, they have been proved to be entirely without foundation - as I always knew them to be." Thanking friends and family for their support, he added that he was "delighted" to now be able to continue with his work as an MP and mental health doctor. The allegations were published in two articles in The Sunday Times on 5 November 2017, based on claims made to the newspaper by Andrew Bridgen, the Conservative MP for North West Leicestershire. The claims were referred to the Conservative Party Complaints Panel, which last year cleared Mr Poulter and found there was "insufficient evidence". The MP said the allegations had led to some "very dark moments" and had taken "a considerable toll" on his health. Under the settlement, Times Newspapers will pay Mr Poulter damages and his legal costs, and will remove the online articles and associated tweets. Oliver Murphy, representing Times Newspapers, said: "The Sunday Times offer their sincere and genuine apologies to Dr Poulter for having published the articles complained of, for the damage these publications caused to his reputation and for the personal distress and embarrassment that their actions have caused him over the past 14 months."